Franky Zapata's "Flyboard Air" flew over a mile, nearly ten times farther than ever before. When footage of a flying hoverboard first emerged last month, many thought it was fake, because the relatively tiny device appears to be breaking the laws of physics. But the "Flyboard Air" from inventor Franky Zapata is real, spectacular and just set a world record for the longest hoverboard flight of all time. It traveled 2,252 meters or 7,388 feet, nearly ten times farther than the mark set last year by Catalin Alexandru Duru on a much larger device. The record has already been certified by Guinness, which attended the event (see the full video, below). 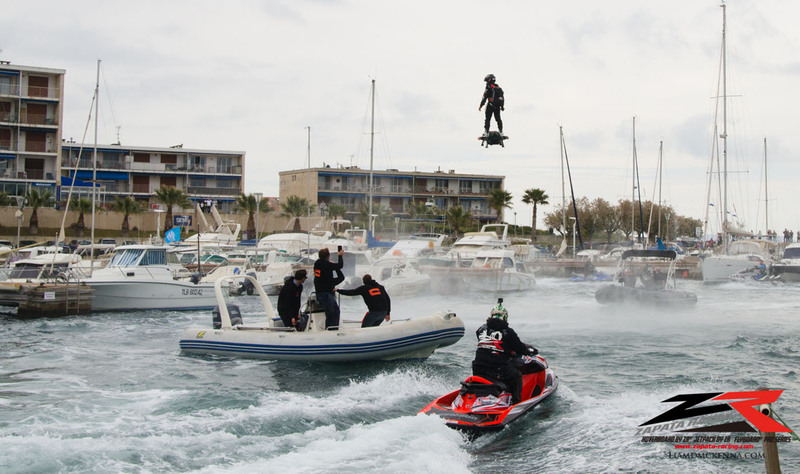 Frenchman Zapata is the man behind the Flyboard, a watersports device that amounts to a firehose attached to boots. However, the Flyboard Air is completely untethered, and has mind-boggling specs -- it can supposedly fly up to 10,000 feet high and hit 93 miles per hour. Zapata makes it look pretty easy to maneuver, though he is a jet ski champ with a lot of experience on the original Flyboard. In fact, he says that it would be insane to try the Flyboard Air without at least 50 hours of experience on the water-powered model. Given the performance, the Flyboard Air makes every jet pack out there obsolete, as it has better range, height, speed and maneuverability. It took Zapata four years to create the device, which runs on four 250-horsepower RC jet engines, according to The Verge. It's powered by Jet A1 kerosene held in a backpack, and engine power is controlled by a hand-held remote. There's no steering wheel, obviously -- the pilot turns by banking and shifting his body weight. Zapata only flies the device above water, and was forced to deliberately splash down recently after the battery system failed. "It broke all the electronics on the board, so it will cost me money, but the rest of it is fine," he told the The Verge. He adds that the system can run on three of the four jet engines in case one fails, and that the sensors and WiFi control channels have triple redundancy. The company plans more demonstrations and will soon release additional footage. As for commercializing it, Zapata has already been approached by numerous companies, and thinks the Flyboard Air would be useful for government and security forces. He's even working on a more advanced design that would be easier for the general public to use. "If everybody wants a Flyboard Air, we have to work with the government, we have to work with liability, we have to work on a thousand things. But why not?"